There we were, mulling around after our Monday night softball game. "Where are we going to eat? ", pipes up Bear. Luckily, I had a list of varied options. I began naming each one followed by a short description. No one seemed all that interested in any of them. Until... I mentioned Dai Jang Kum... That drew giggles and smiles from everyone especially Milhouse. He emphasized the last word in the name... And for those who are unfamiliar, "Dai" in Chinese means big and "Jang" sounds similar to excellent (a la Wayne's World). If you put it altogether... well, you get the picture... Wait, maybe you don't want that picture! 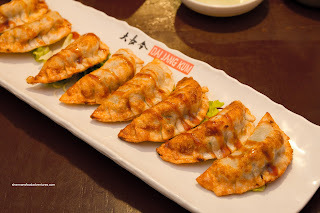 Without even knowing anything about the place, I found myself heading to Dai Jang Kum because everyone wanted to see what I would do with it as a post. Oh man... Reminds me of Zakkushi and Come Along. As we pulled up the restaurant, it looked like Dark Helmet came first... er... Anyways, I reached for my camera to take a picture of the front (as I always do). For the first time ever, Milhouse took a picture as well. I guess he really wanted to remember Dai Jang Kum! We had a fairly large group of 9 and they put us in a room. This way, I guess we could enjoy in privacy... While perusing the large menu, I came across #23. Uh... Combo Special "Kum" (that is exactly how it is written too!). Really? Must they make it that easy?. Wow, $100.00. Must be some special stuff eh? Okay, before we get into that combo, the obligatory Banchan arrived consisting of stewed potatoes, seaweed, fish cake, pickled radish, bean sprouts, kimchi and daikon. "Look! there is Dai Jang Kum on all of the plates! ", exclaimed Bam Bam. Uh... Pebbles was not impressed. Anyways, this was a varied selection which was above-average. The BBQ Meats (Short Ribs, Beef, Chicken and Pork), which was part of our combo, were quite bland and really needed more marinade. Other than that, they were okay. After we started grilling the meats, everything came at us faster than we could eat them (this is what I said to the group and all they could do was laugh uncontrollably...). Presented on a long plate were the Gunmandu (panfried dumplings or in this case, deep fried). They were crispy and glistening with oil. The filling was moist and not-gritty. The accompanying sauce was quite sweet though. 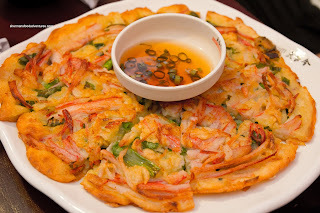 The Haemul Pajeon (Seafood Pancake) arrived on a plate rather than the usual cast iron pan. It was somewhat doughy, yet was crisp on both sides. We liked that it wasn't overly greasy, but there was a serious lack of seafood. Instead, there was a copious amount of green onion. Maybe it should've been called a green onion pancake instead. 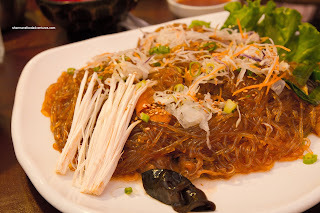 Up next was a large plate of Japchae (Sweet Potato Noodles). The noodles were wet and a bit too soft. 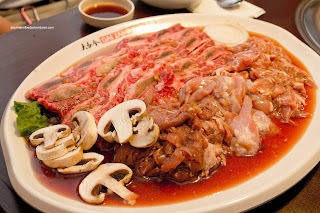 Again, there was an obvious lack of ingredients as I could barely see any beef, mushrooms and veggies. One thing we did like was the balance as it wasn't too sweet. We ended up with 2 orders of the Dolsot Bibimbap (Hot Stone Bowl Rice) and Boss Woman was not able to steal the egg this time around (see Jang Mo Jib). Well, she could've stole it, but it was raw (since it was the stone bowl version) and I'm pretty sure she didn't want a raw egg yolk! Although there wasn't anything inherently wrong with the ingredients, there was one issue. The rice never formed a crust at the bottom of the bowl. Either the rice was too wet or the bowl wasn't heated enough (or both). Disregarding that, it was alright. 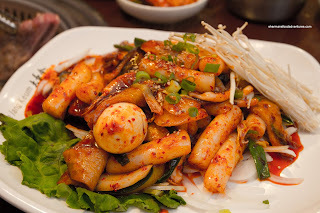 Dark Helmet suggested we go for the Ddeokbokki (Spicy Rice Cake) and it was a good call. It was a large plate of 3 Types of rice cake, veggies and a boiled egg in a sweet spicy sauce. There was a good kick which was not overbearing. Moreover, there was just enough sauce to coat everything rather than pooling up at the bottom of the plate. The rice cake were nicely textured riding the fine line between chewy and soft. Interestingly, we got our 2 orders of soup at the end of our meal. This probably had something to do with the preparation time. First up was the Gamjatang (Pork Bone Soup). Since no one seemed that interested in the pork bone, I took one for myself. I tried to offer my bone to Milhouse, but he just chose to conveniently look away... Well, the meat was tender while the soup was quite mild. It was not as rich as I would've liked as it was slightly thin. 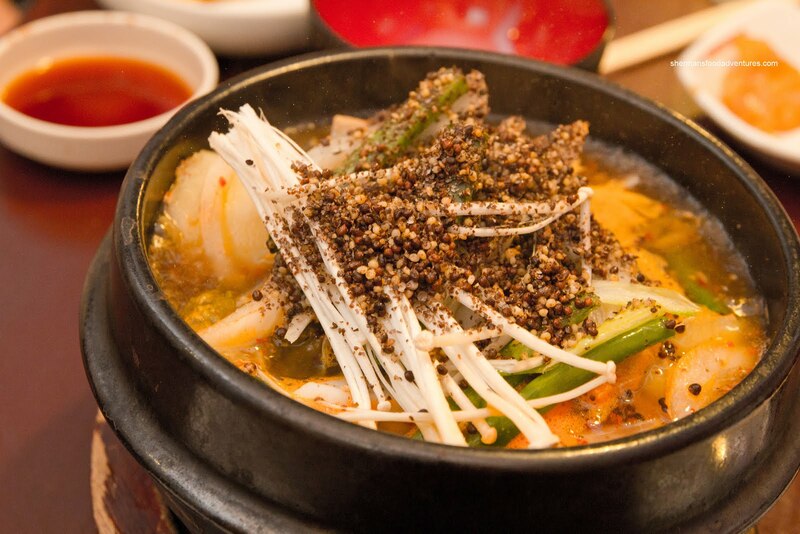 The very last item that hit the table was the Soondubu Jjigae (Seafood Tofu Soup) that came with our Combo Special "Kum". This was a pretty large serving considering it was only a combo meant for 4 people. 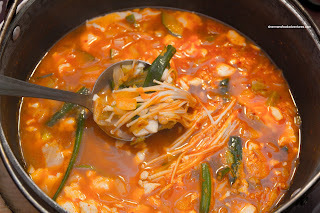 It was spicy, yet not too much so while being quite flavourful (MSG?). It was full of soft tofu and only had a modest amount of shrimp and mussels. I preferred this soup over the pork bone. 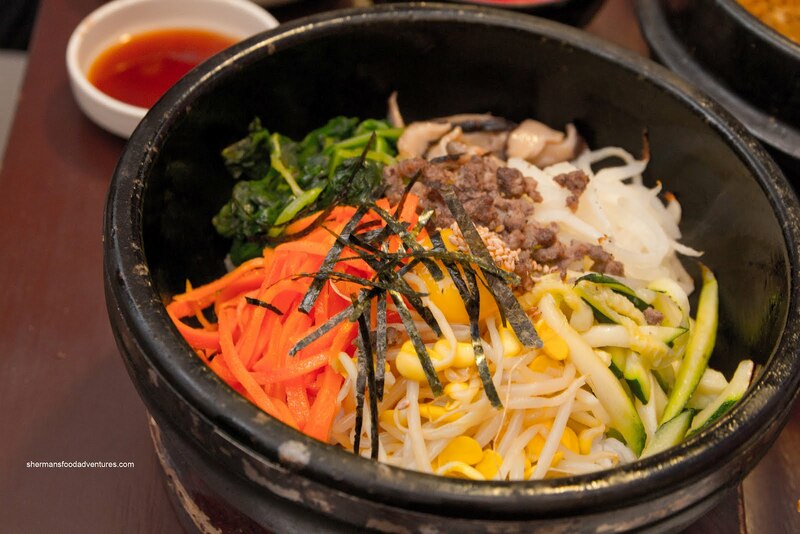 For roughly $23.00 per person including taxes and tip, this is pretty standard pricing for a Korean restaurant. 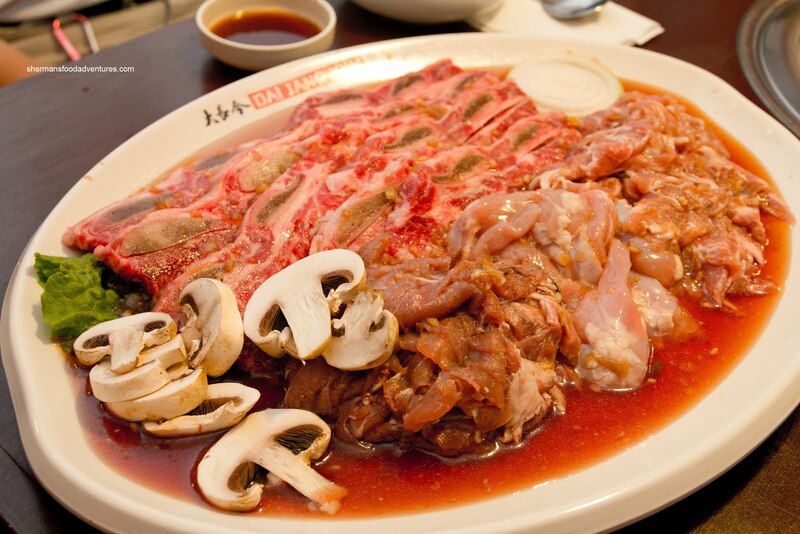 We probably could've dusted off a few more dishes if we had to order again. In terms of the food, on the hole, er... sorry, I mean whole, was pretty average. However, it did the job for a relatively reasonable price. 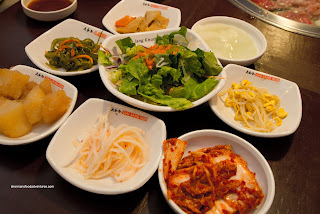 The service we got was pretty decent, which is an achievement in an Asian restaurant, let alone a Korean one. So it begs the question: would we "kum" again? Well, that would be depend on our mood.